Friday afternoon's Regional Semi-final victory over Wolfforth Frenship was as routine as a game this deep in the playoffs will ever get. Before a raucous crowd of LDS supporters, the Lady Dragons dominated the pitch from minute one. And on the strength of seniors Taylor Tufts' two goals and Madi Drenowatz's one, Lady Dragon Soccer registered their first shutout of the 2019 playoffs. For most of the first half the Lady Dragons worked the ball up and down the field on the Lady Tigers only to see shot after shot go over the bar, off the post or in the Frenship goalie's stomach, until Tufts tickled the twine mid-way thorough the first half and then again midway through the second. Taylor was unmarkable on this day and Madi Drenowatz joined the party as well with the final tally with just under three minutes left in the game. The Tigers registered only two shots on goal for the entire game and Madi Martin only had to turn away one serious chance on a corner midway through the second half. 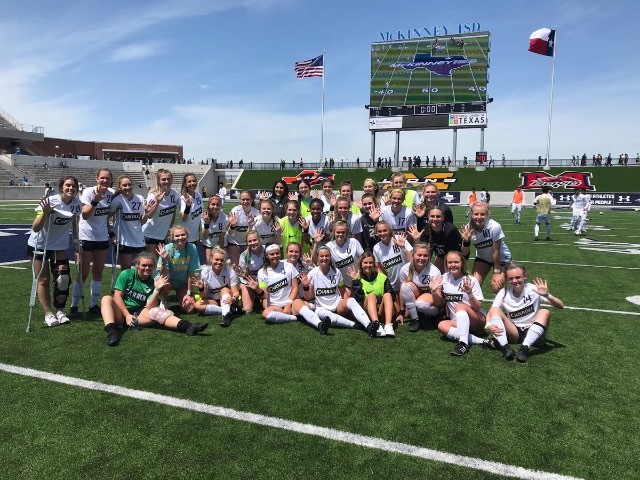 The Lady Dragons, 25-1-2, advance to the Region 1 final to play a surprising and red hot J.J. Pearce side who defeated Arlington in the Regional tournament opening game. The match, which will determine the Regional 1 representative in the state tournament is scheduled to begin at 10am at McKinney ISD Stadium. Emphasis on the word scheduled because there is a 100% chance of severe thunderstorms arriving in the McKinney area at that time, so check back on DragonSportsNetwork.com for updates. Post match notes - Lady Dragon Soccer wishes to extend special thanks to all students and coaching staff members who attended today's match. Your boisterous support was greatly appreciated and we need you all again tomorrow whenever the match is. The Regional Final appearance will be the Lady Dragon's 11th all time and they will be seeking their 5th trip to the state tournament. We want to see you all tomorrow for a very big day of soccer.